Fig. 1—Graph showing interaction between yield stress and n-value. 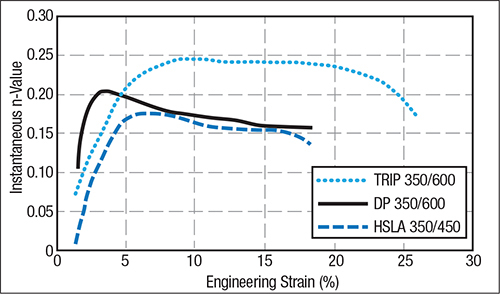 These data are not applicable to the new advanced high-strength steels. Mild and high-strength steels are available with many levels of strength and formability. Metalformers across the world use different properties to specify and order their steel, yield and tensile strength being the most common. Press shops often receive certifications with their incoming coils; these only specify composition, and lack information about formability. Stamping of metal parts requires property information that exceeds the conventional yield and tensile strengths. Two additional key properties, workhardening exponent (n-value) and the forming-limit diagram (FLD), often are not included with the shipping information. And, not all press shops have the test equipment needed to obtain their own data. Fortunately, some general properties for steels can be found, while other information can be estimated. The n-value for mild and high-strength steels tends to remain constant over the entire deformation life of the steel. If the yield strength is known, the n-value can be obtained from the curve in Fig. 1. As strength increases, n-value decreases; metallurgical methods that strengthen the steel also restrict its stretchability, by reducing the n-value. Plotting the n-values from different coils of steel can provide the relative formability information that metalformers need. 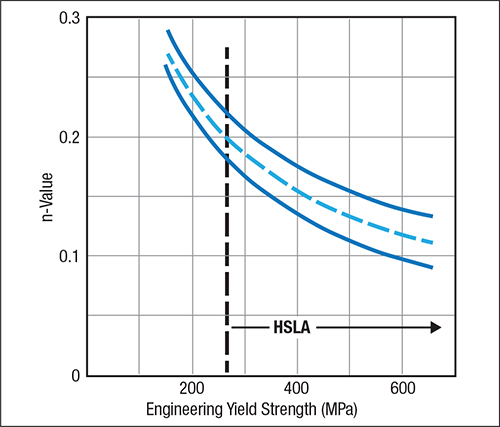 However, metalformers cannot use this curve to evaluate advanced high-strength steels (AHSS). The properties of these steels change during deformation, requiring the use of instantaneous n-values (Fig. 2). Here we show instantaneous n-values for three different AHSS grades with the same yield strength. The TRIP steel reaches an n-value of 0.25, the same as a vacuum-degassed interstitial-free mild steel, with a yield strength half that of the TRIP steel. Another indicator of high n-value is total elongation. Under the same test conditions (Fig. 2), the sample with the largest total elongation also has the highest n-value and stretch capacity. Similarly, the FLD also depends greatly on n-value. Fig. 2 reveals that the TRIP steel has the highest FLC0 and the largest safe zone for stretching. Fig. 3—The rate of climb from yield to tensile strength denotes the magnitude of the n-value. Coil #3 has more stretchability than the other two steels. One way to sort the formability capabilities of various coils of steel with the same yield strength is to pull tensile tests, from yield point to maximum load. Fig. 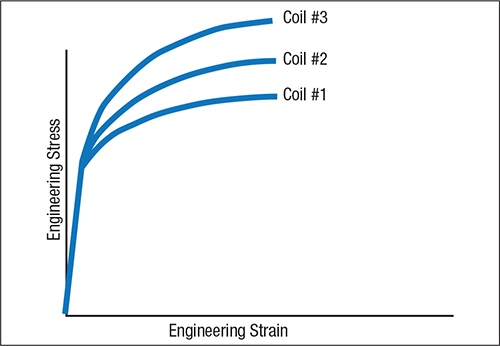 3 shows the increase in strain for three different coils, with coil #3 exhibiting the highest n-value and therefore the largest increase in strain. We’d recommend this coil for stamping parts that require high stretchability. Note: Some steel mills sell coils specified as standard, plus 10 or 20 ksi of strengthening. The best evaluator of stretchability is the hemispherical dome test, used in many laboratories and research centers. Here a machine forces a 4-in.-dia. domed punch into the center of a clamped blank, with circle grids etched into its surface to allow for strain measurements. The blank stretches until a ring of thinning occurs at some distance below the pole of the dome. With the data collected and plotted (Fig. 4), we can see that the central portion of each curve is depressed due to restricted material flow during the initial punch-to-blank contact. Fig. 4—Data from a hemispherical dome test. Increased n-values prevent sharp gradients from forming and allow more stretching. The dashed lines are strain gradient peaks created due to an n-value less than 0.15. Note the flattening of the strain gradient as the n-value increases from 0.20 (aluminum-killed drawing-quality steel) to 0.25 (vacuum-degassed interstitial-free steel). The remaining two curves (0.35 and 0.45 n-values) represent austenitic stainless steels. The higher n-values force a more uniform strain distribution in the presence of strong stress gradients. The dashed line shows high-peaked, narrow gradients of concentrated strain when n-values drop below 0.15. These create many of the stretching problems associated with higher-strength steels.